Growing food at home is more popular than ever because of the economy to a degree, but more importantly because of the growing interest in health and nutrition. The only way to be absolutely sure about your food is to grow it yourself. Many are also learning for the first time how much fun it is and that it isn’t hard to do – especially with organic techniques. Recently our newsletter addressed the worst GMO foods to avoid. With genetically modified foods (GMOs) becoming an important issue, I’m getting more and more questions about the subject and not just about eating GMO foods, but growing safe food in a garden. The only good thing about GMO's is people are resisting these foods and taking control of their food consumption by going back to vegetable gardening and orchards for safety and nutritional reasons. Is it Time for Victory Gardens again? What is a backyard or Victory against GMO's Garden? During World War I and World War II, the United States government asked its citizens to plant gardens in order to support the war effort. Millions of people planted gardens. 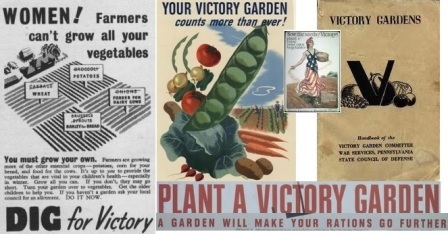 In 1943, Americans planted over 20 million Victory Gardens, and the harvest accounted for nearly a third of all the vegetables consumed in the country that year. 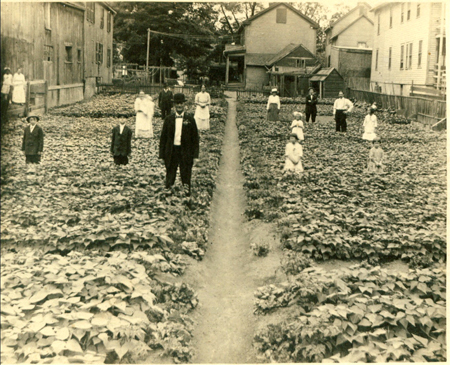 Emphasis was placed on making gardening a productive pastime as well as a national duty. Why plant a victory garden? Today food travels an average of 1500 miles from farm to table. Processing, packaging and transporting wastes energy and causes pollution. What can I grow in a Victory Garden? Grow what you want to eat: beans, beets, broccoli, cabbage, carrots, celery, collard, corn cucumber, garlic, kale, lettuce, melons, mustard greens, okra, onions, peppers, peas, pumpkins, spinach, squash, tomatoes, turnips, watermelon and herbs. You can also plant fruit such as pears, peaches, plums, apples, figs, grapes, pomegranite and jujube. Planting a Victory Garden can help fight pollution by reducing the miles of pollution from the farm to your table. Our current economic situation is another good reason to start a Victory Garden. Every time that food is shipped from the farm to the store and then to your table, gasoline is used. As gasoline prices rise, food costs rise. I have no backyard, what can I do? You can combine vegetable plants with flowers in your front yard. You can plant containers on your porch, patio or balcony and can grow sprouts indoors. Check with a neighbor or friend who is unable to garden and possibly they would let you garden their yard, in exchange for some produce. Community gardens are another possibility. If these options are not available, you can also choose to purchase foods which are grown close to home by visiting your local farmer’s market, joining a CSA (Community Supported Agriculture) or using a home delivery service. If local foods are not available to you, choose foods which use fewer toxic pesticides and synthetic fertilizers. One of my favorite books is Texas Organic Vegetable Gardening. Malcolm Beck and I worked on it together. It has a terrible title for two reasons. One, it is very useful anywhere food crops are grown, not just in Texas and two, the book covers fruits and many herbs in addition to vegetable crops. It also talks about how to have an edible landscape. It is available at some garden centers, book stores and online books stores. P.S. Join me this Saturday at Learn 2 Live Green in Plano, TX - upcoming events.